Developer Dodge Roll has revealed its roguelike shooter Enter The Gungeon will be receiving an exclusive Nintendo Switch retail release in North America on 25th June for $29.99, thanks to the assistance of Devolver Digital. 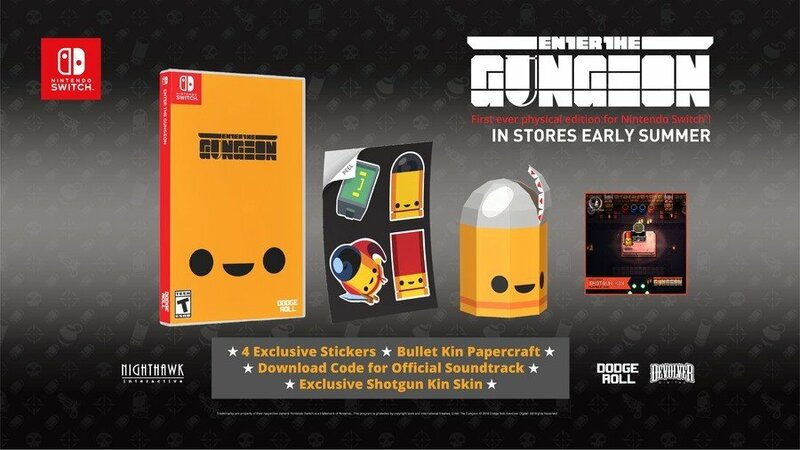 If you haven't played Enter the Gungeon before, it's an endlessly replayable bullet hell roguelike with satisfying combat, random levels, multiple weapons, a variety of items and many secrets. The final DLC pack 'A Farewell to Arms' comes out today, which also happens to line-up with the game's three-year anniversary. This update includes two new playable characters, more guns, floors, items, and a new rainbow mode. Read more about it in our previous post. Will you be trying out the game's final DLC pack? Would you be interested in a physical copy of the game for your Switch library? Tell us down below. awwww why they have to wait till now. I do not understand the hype. it's one of the slooowest twin sticks out there and just pretty dull. @SuperCharlie78 I don't see the discount in either swiss or french eshops. Do you know if the reduction is only available in certain countries or at a limited time? Bought the game couple days ago and having a blast with it. Havent seen floor 3 yet, but still. Awesome game! Will check the update characters later today as well, between Dragon Ball Heroes sessions. @JamesJose7 Sorry i forgot those are illegal now. @YANDMAN Hello I'm from the sarcasm police, please no need to make it difficult for you, just get in the car. You know your rights. Looks cool, I've been interested in the game for a while, so will probably pick up a copy. If it doesn't get an EU release, 365Games are usually pretty good about stocking international copies for sale in the UK. I got Guacamelee One-Two Punch collection on pre-order from them, and it's where I got Monster Boy and the Cursed Kingdom. I guess this means I’ll be buying this a second time. ...And it’s been totally worth it. Brilliant game. 2nd most played Switch game after Breath of the Wild. Might be the best $15 I ever spent. Looking forward to even more Gungeon runs this weekend. Weren't Special Reserve Games supposed to be manhandling the physical for this at one point? I only ask as it had that saweet saweet art book with it, the Ammnominomicon or something? Dang I need me that art book. @YANDMAN sorry for the misunderstanding. What I meant was that you structured your sentence as if the game was objectively bad and poor reviewed, when it's not true. Didn't say it's wrong to dislike it. @JamesJose7 Ah i see. I personally find the game very slow and tedious. I have tried to love it as everybody seems to get excited about it but i still just find it slow and tedious. I'd go as far as to say it's the least interesting twin stick i've played. Really wanted this... a year ago! Definitely not double dipping. They should have made it more clear they would do a physical release. Good to know, guess I'll finally dive in. @YANDMAN fair enough, what twin stick shooters do you recommend? Who would wanna play this, when....you know.......NUCLEAR THRONE IS OUT!! What's a Europe? Is that a food? I'm hungry for some... Hungary. 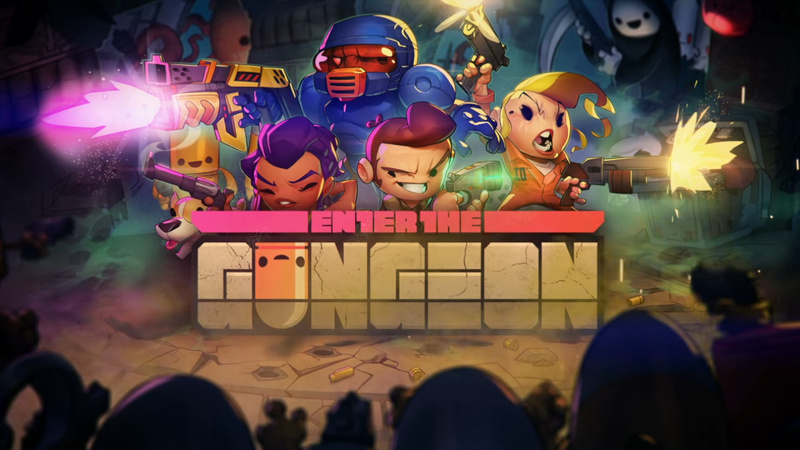 @proof21 Nuclear Throne is pretty good, but, it's no Enter The Gungeon. Not that it's bad, it's just those are very different games. I like both, but, am looking forward to Super Crate Box. I mean Police car, you're getting booked! @Nintendo_Thumb Nuclear Throne is a work of genius, Enter the Gungeon tries too hard. Kind of how Sonic tried to be the Mario of Sega, had way more bells and whistles, but in the end.....well you know. I was planning to get this digitally, with the goodies included, I think I may consider this physical edition instead. @MayorBigDeal I have that artbook,numbered and sealed. I got it from Special Reserve games as you would prolly know. I can sell it you if you want it. Also I wanted to message you directly but I do not know how on this site, if that’s even possible. Reply to me if you are intrested, also I live in The Netherlands. @Reigestugatensho Bro! I'm connected, i know people at Nintendo. They put people down pipes, you never see em again, capiche? @proof21 i have yet to try it but it does lolok pretty good, is it fast paced as Gungeon is terribly slow and boring. Finally got the game on the eshop sale. It's great! but rather hard. Considering it's file size and the amount of time it's taken to bloody release a physical release, I'm fine with digital. Games like 88 Heroes on the other hand have been out in physical format since the start and are really cheap by comparison. It was already being sold as physical by Limited Run Games or one of the others for a long time. Seems to have been pulled out from there now..
@YANDMAN yeah, it's much faster, no wandering around at all, and it puts you right into the action after you die. 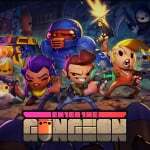 I honestly think Enter the Gungeon doesn't hold a candle to it. @proof21 i comne from the Robotron school of Twin Stick and whilst there probably isn't another game made since that that has that level of intensity, it's the speed and frantic play that i look for. Wandering around with a weak gun is not for me. @YANDMAN Ever actually tried Turbo Mode to make the game faster? @Reigestugatensho Nope, didn't even know it was a thing. I don't think that would make it any better though really. Shooters whether twin stick or standard need to have a balance between fire power, fire power noise, speed of play and how frenetic it is. When these are balanced correctly thats when you get an amazing game. Enter the Gungeon is a slow plod with weak weapons that just aren't fun. Clearly a lot of people like this game but it's just not for me. @YANDMAN I hardly think those weapons were weak... Ok maybe the starters (and that awful derringer). I too thought the game was slow, that was until they released the Advanced Gungeons and Draguns update. It added an NPC who (when found and rescued in the 2nd floor) could enable turbo mode when you were in the Breach. It made the game very enjoyable, I couldn't go back to the game's normal speed after that! @MayorBigDeal the price of the book for normal value and shipping cost. I will not be responsible for any extra cost like importtax if thats applied in the UK. @Reigestugatensho never played it long enough to discover any such person. it just isn't frantic enough to hold any interest for me. @KoekiieWoekiie Ace House! I'll have a think on it and get back to you if I want to go ahead with it. Thanks!